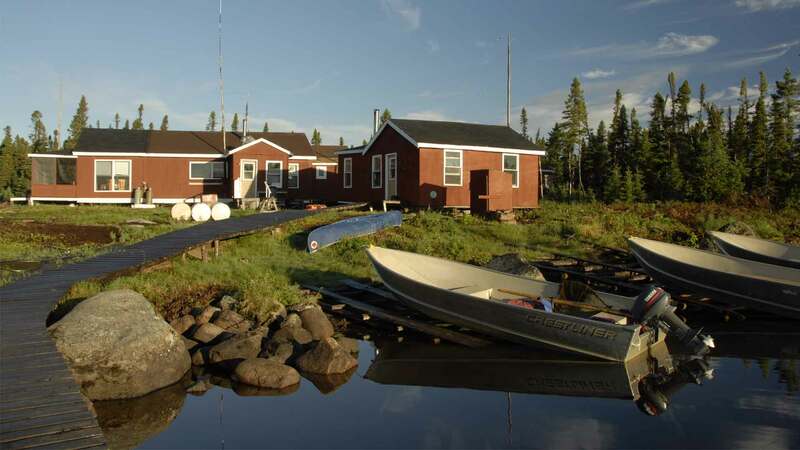 Crooks Lake Lodge is located on the famous Upper Eagle River watershed, south of the Mealy Mountains, a 60-mile floatplane flight from Goose Bay. Comfortable, unpretentious lodge caters to six anglers per week. Crooks Lake is five miles long with rivers and streams entering and leaving the lake that are full of brookies that run 2-to 8-pounds, with an average size of about 5-pounds. Crooks Lake Lodge opened in 1990. For the last three decades, the Lodge's catch-and-release policy has sustained a high-quality wild brook trout fishery. Though commonly called a trout, the brook trout is actually a char - along with lake trout, dolly varden, and the Arctic char. 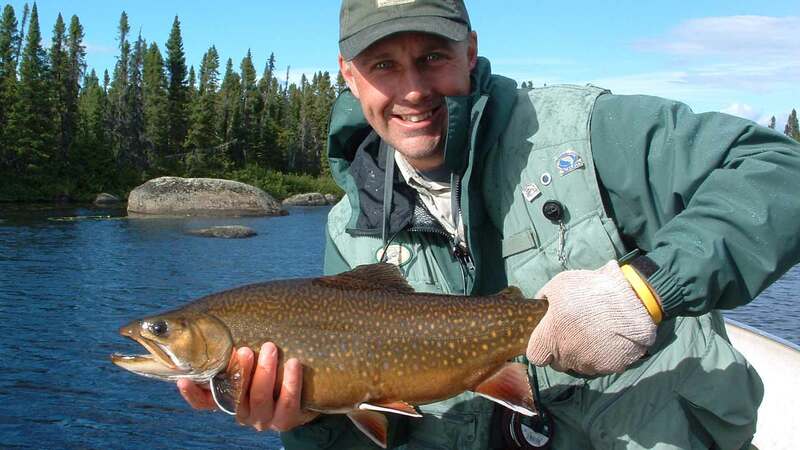 The brook trout is native to the many rivers and lakes in Labrador. Fly fishing is the most popular fishing method for brookies. Streamers, nymphs, dry flies and mouse popper imitations are very effective. The best dry fly fishing is from late June to late July. Spinning gear with single barbless hooks is permitted in Crooks Lake only. A government study in 2005, determined that the average brookie caught at Crooks Lake weighed over 4.5 pounds. At Crooks Lake Lodge, there is a lot of opportunity for anglers who like to wade. Catch-and-release is encouraged. Two anglers per guide and outboard boat. 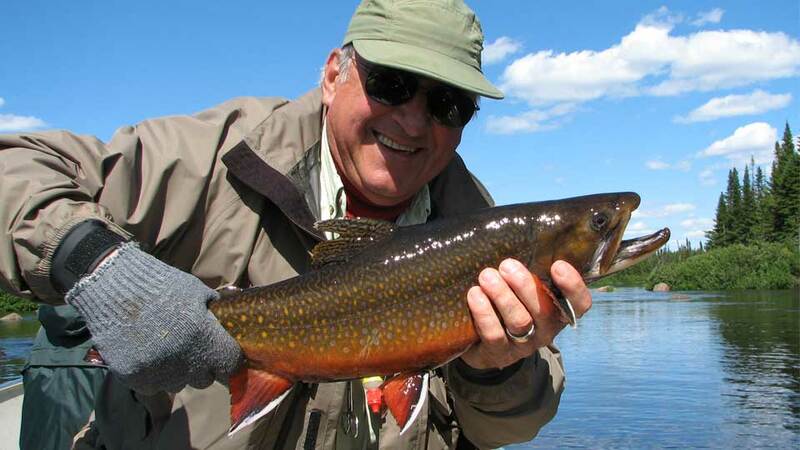 3-minute video of Brook Trout Fishing. 2019 season: The Lodge is open eight weeks for peak fishing from June 7 to July 23, 2019. Fishing methods: Most fishing is done in the rivers and streams with dry fly equipment. Light spinning gear may be used with barbless hooks but permitted in the lake only. Boats: 16’ aluminum boats with 15-HP engines. Guides: The Lodge has three experienced and mature fly-fishing guides. 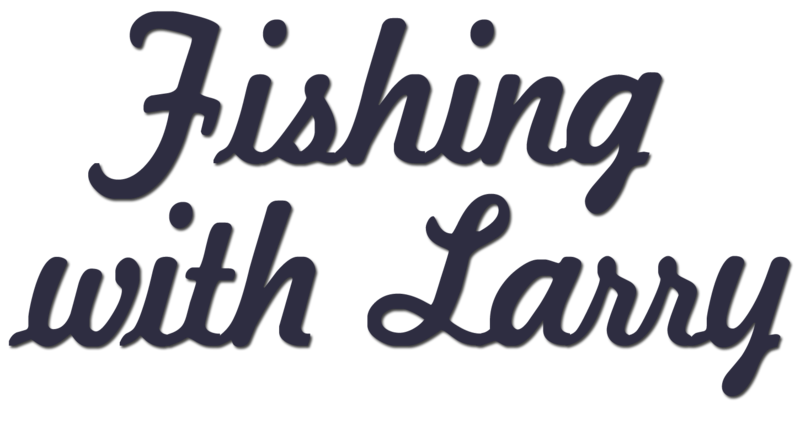 They can offer tips and proven techniques to both beginners and accomplished fly anglers. Equipment: The Lodge does not supply fishing tackle or the use of fishing rods and reels. A detailed list of what you'll need to bring is included in our confirmation packet. You're guided 8 to 10-hours each day. You’ll have breakfast between 7:00 and 7:30 a.m. If you’d like to fish earlier than that, there is good fishing right in front of the Lodge. After breakfast, you’ll join your guide for a 15-minute boat ride to the fishing area. Most anglers choose to return to the Lodge around 1:00 p.m. for lunch; however, lunch on the river is also an option. Depending on your wishes and the weather, you may choose to rest in the afternoon and fish after dinner in the evening instead. The guides are as accommodating as possible. Dinner is served around 6:00 p.m. each evening. Large northern pike up to 20-pounds are also plentiful. 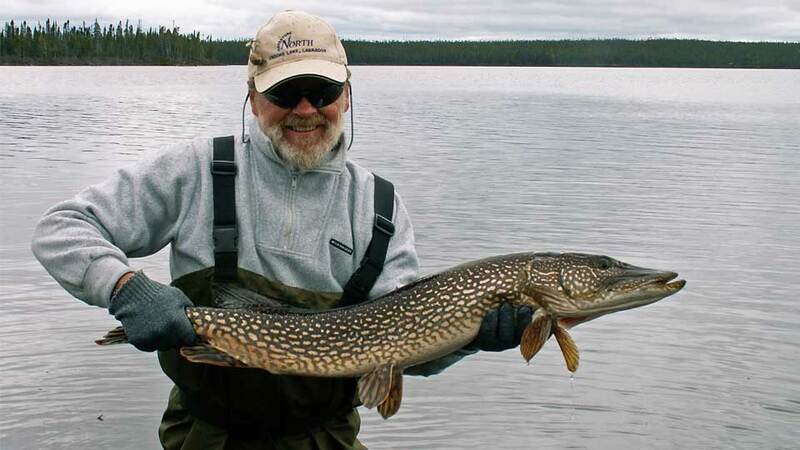 Northern Pike provide a secondary challenge for fly fishermen who choose to take them on light tackle. These fish are known for their savage strikes. Northern pike fishing season begins in mid-June. Pike are caught with spoons, large crankbaits and large poppers and streamers. Typically found in the shallower weedy areas of the watershed, these fish are the barracuda of the North, feeding on anything that swims, including voles, duckling, and even trout. Anglers are well advised to bring wire tippets as their surgical scalpel-like teeth will slice through monofilament like a knife through butter. They love mice patterns, but will also explode on big poppers and large saltwater streamer patterns. Commercial flights are available to Goose Bay Airport in Goose Bay, Labrador. You will need to arrive in Goose Bay the day before your departure to the Lodge. The Lodge will have a representative meet you at the airport, take you to your hotel and then to the float plane the next morning. They will do the same on your departure date. 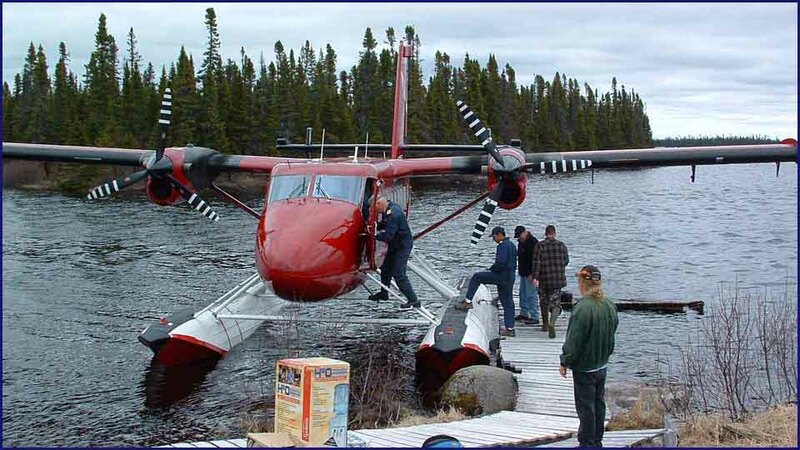 Early the next morning, you'll be driven to the floatplane for your 35-minute flight to the Lodge. The baggage weight limit is 50-pounds for this flight. Ground transfers to/from the hotel are included in your package price, however hotel rooms and meals in Goose Bay are not. On your return home, book your flight after 12:00 noon and you will not need to overnight in Goose Bay. Comfortable, unpretentious lodge in a wilderness setting. The main lodge overlooks the lake and consists of a kitchen, dining and lounge area, three large bedrooms and a screened-in sun porch. 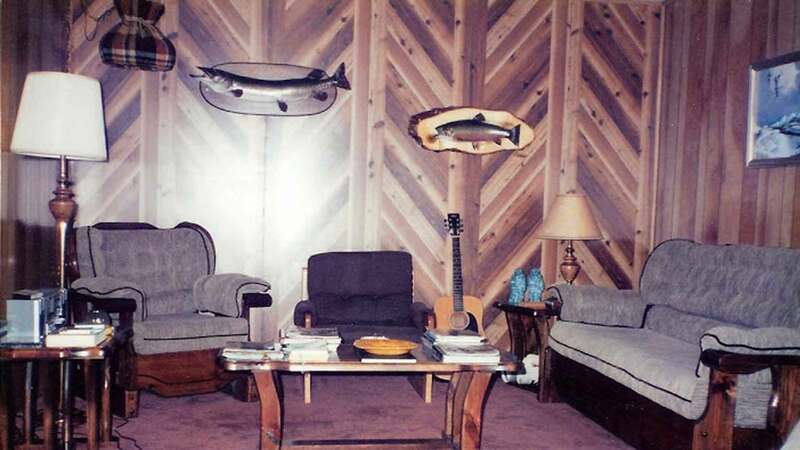 The Lodge is limited to six anglers per week, with an emphasis on personal attention. Their cook prepares three delicious home-cooked meals each day. Communications: Generated power, Internet, Wi-Fi and telephone service are available for your convenience. 7.5% sales tax is not included. It's not too early to book for 2020. Please call us for availability. 1-800-205-3474. 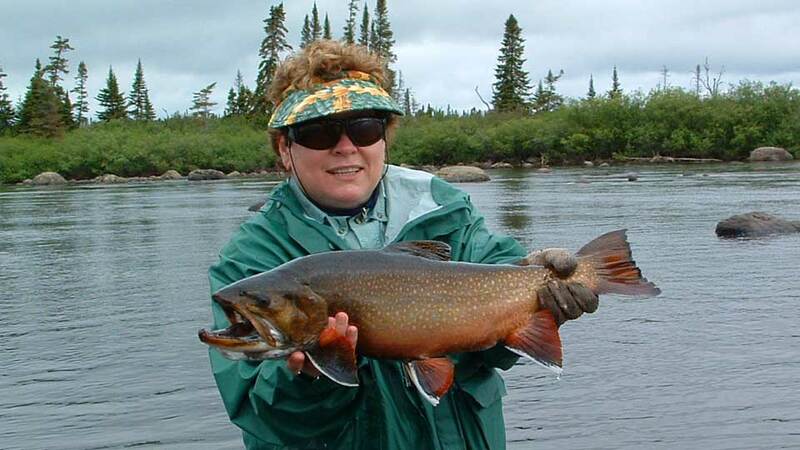 Airport reception and transfers in Goose Bay, roundtrip float plane flight between Goose Bay and the Lodge, accommodations and meals at the Lodge, guided fishing, fishing license, Wi-Fi, and use of satellite phone. Airfare to Goose Bay, Labrador; hotel and meals in Goose Bay, fishing tackle, the use of rods and reels, liquor (may be ordered in advance and sent to the Lodge), gratuities, 7.5% GST, and anything not mentioned under inclusions. 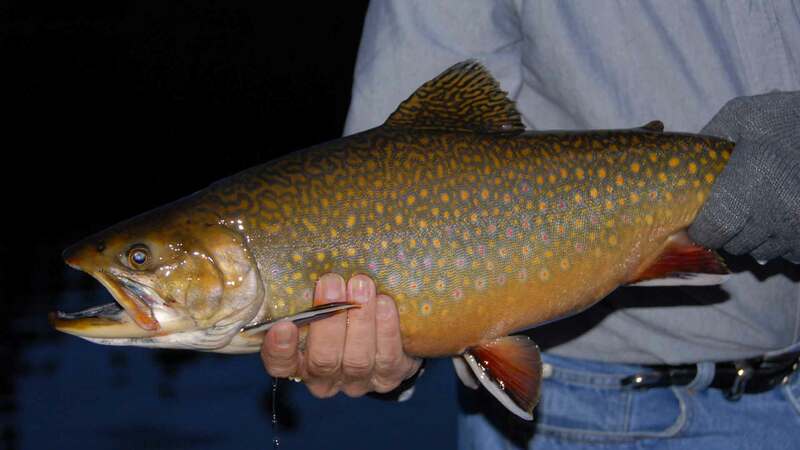 At Crooks Lake, brook trout feed voraciously on the abundant insects. Hatches of mayflies, stoneflies,or caddisflies can occur anytime, and when they do, you had better be ready! Depending on the time frame, anglers should also bring an assortment of wooly buggers, and saltwater deceivers. Later in the season at Crooks Lake, when the hatches taper off and the fish start to stage for spawning, a popular fly is the “shaving brush”. It is a big spun caribou or deer hair popper with a blunt end that pops as you retrieve it in short jerks. The more noise the better. Apparently the fly mimics a lemming or a mole, both of which are plentiful. The brook trout don’t love this fly, they hate it, and prove it by smashing at it with a vengeance, often coming a foot out of water when they strike!